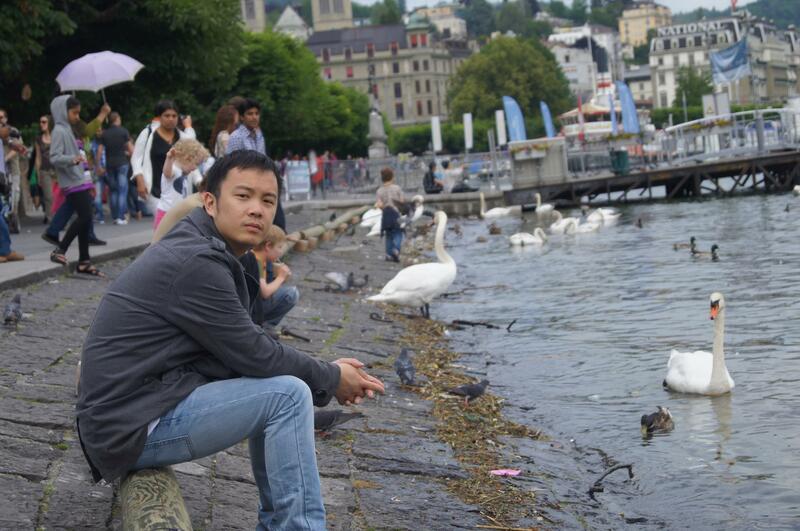 Yang is a Ph.D student in Software Engineering at University of California, Irvine, advised by Prof. James. A. Jones . His research focuses in the area of the program comprehension, testing, debugging, program analysis, and crowdsourcing software engineering. Before joining UC Irvine, he recieved his B.Eng and M.E. degree in software engineering at Nanjing University, China, worked with Prof. Zhenyu Chen and Prof. Baowen Xu. 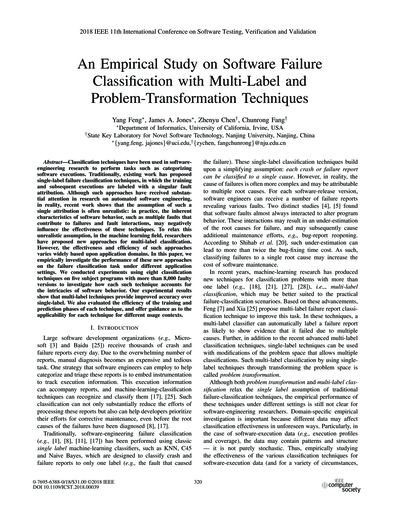 An Empirical Study on Software Failure Classification with Multi-label and Problem-Transformation Techniques. Yang Feng, James A. Jones, Zhenyu Chen, Chunrong Fang. IEEE 11th International Conference on Software Testing, Verification and Validation (ICST), Västerås, Sweden, April 2018, pp. 320–330. Classification techniques have been used in software-engineering research to perform tasks such as categorizing software executions. Traditionally, existing work has proposed single-label failure classification techniques, in which the training and subsequent executions are labeled with a singular fault attribution. 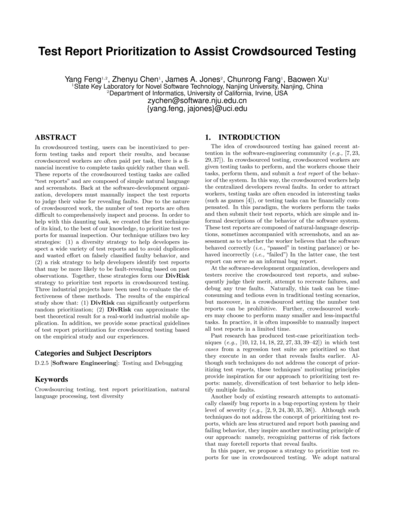 Although such approaches have received substantial attention in research on automated software engineering, in reality, recent work shows that the assumption of such a single attribution is often unrealistic: in practice, the inherent characteristics of software behavior, such as multiple faults that contribute to failures and fault interactions, may negatively influence the effectiveness of these techniques. To relax this unrealistic assumption, in the machine learning field, researchers have proposed new approaches for multi-label classification. However, the effectiveness and efficiency of such approaches varies widely based upon application domains. In this paper, we empirically investigate the performance of these new approaches on the failure classification task under different application settings. We conducted experiments using eight classification techniques on five subject programs with more than 8,000 faulty versions to investigate how each such technique accounts for the intricacies of software behavior. Our experimental results show that multi-label techniques provide improved accuracy over single-label. 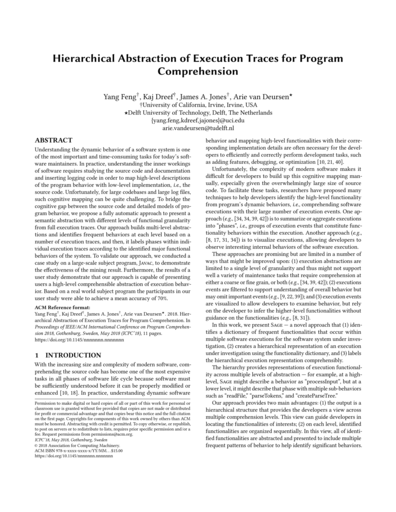 We also evaluated the efficiency of the training and prediction phases of each technique, and offer guidance as to the applicability for each technique for different usage contexts. Generating Descriptions for Screenshots to Assist Crowdsourced Testing. Di Liu, Xiaofang Zhang, Yang Feng, James A. Jones. 2018 IEEE 25th International Conference on Software Analysis, Evolution and Reengineering (SANER), Campobasso, Italy, March 2018, pp. 492–496. Crowdsourced software testing has been shown to be capable of detecting many bugs and simulating real usage scenarios. As such, it is popular in mobile-application testing. However in mobile testing, test reports often consist of only some screenshots and short text descriptions. Inspecting and understanding the overwhelming number of mobile crowdsourced test reports becomes a time-consuming but inevitable task. The paucity and potential inaccuracy of textual information and the well- defined screenshots of activity views within mobile applications motivate us to propose a novel technique to assist developers in understanding crowdsourced test reports by automatically describing the screenshots. To reach this goal, in this paper, we propose a fully automatic technique to generate descriptive words for the well-defined screenshots. We employ the test reports written by professional testers to build up language models. We use the computer-vision technique, namely Spatial Pyramid Matching (SPM), to measure similarities and extract features from the screenshot images. The experimental results, based on more than 1000 test reports from 4 industrial crowdsourced projects, show that our proposed technique is promising for developers to better understand the mobile crowdsourced test reports. 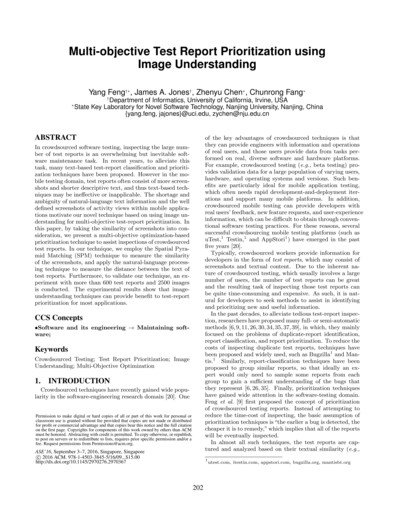 Multi-objective Test Report Prioritization using Image Understanding. Yang Feng, James A. Jones, Zhenyu Chen, Chunrong Fang. 2016 31st IEEE/ACM International Conference on Automated Software Engineering (ASE), Singapore, Singapore, September 2016, pp. 202–213. In crowdsourced software testing, inspecting the large number of test reports is an overwhelming but inevitable software maintenance task. In recent years, to alleviate this task, many text-based test-report classification and prioritization techniques have been proposed. However in the mobile testing domain, test reports often consist of more screenshots and shorter descriptive text, and thus text-based techniques may be ineffective or inapplicable. The shortage and ambiguity of natural-language text information and the well defined screenshots of activity views within mobile applications motivate our novel technique based on using image understanding for multi-objective test-report prioritization. 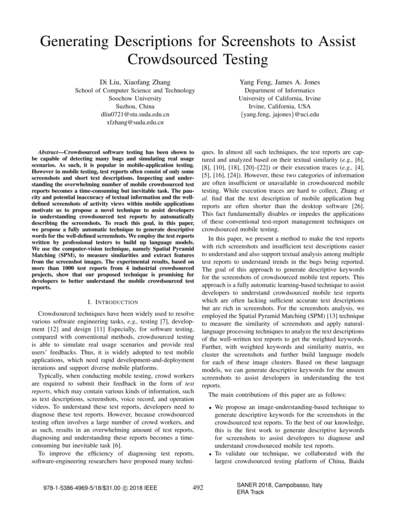 In this paper, by taking the similarity of screenshots into consideration, we present a multi-objective optimization-based prioritization technique to assist inspections of crowdsourced test reports. In our technique, we employ the Spatial Pyramid Matching (SPM) technique to measure the similarity of the screenshots, and apply the natural-language processing technique to measure the distance between the text of test reports. Furthermore, to validate our technique, an experiment with more than 600 test reports and 2500 images is conducted. The experimental results show that image-understanding techniques can provide benefit to test-report prioritization for most applications. Test Report Prioritization to Assist Crowdsourced Testing. Yang Feng, Zhenyu Chen, James A. Jones, Chunrong Fang, Baowen Xu. Proceedings of the 10th Joint Meeting of the European Software Engineering Conference and the ACM SIGSOFT Symposium on the Foundations of Software (ESEC/FSE), Bergamo, Italy, September 2015, pp. 1–11. In crowdsourced testing, users can be incentivized to perform testing tasks and report their results, and because crowdsourced workers are often paid per task, there is a financial incentive to complete tasks quickly rather than well. These reports of the crowdsourced testing tasks are called "test reports" and are composed of simple natural language and screenshots. Back at the software-development organization, developers must manually inspect the test reports to judge their value for revealing faults. Due to the nature of crowdsourced work, the number of test reports are often difficult to comprehensively inspect and process. In order to help with this daunting task, we created the first technique of its kind, to the best of our knowledge, to prioritize test reports for manual inspection. Our technique utilizes two key strategies: (1) a diversity strategy to help developers inspect a wide variety of test reports and to avoid duplicates and wasted effort on falsely classified faulty behavior, and (2) a risk strategy to help developers identify test reports that may be more likely to be fault-revealing based on past observations. Together, these strategies form our DivRisk strategy to prioritize test reports in crowdsourced testing. Three industrial projects have been used to evaluate the effectiveness of these methods. The results of the empirical study show that: (1) DivRisk can significantly outperform random prioritization; (2) DivRisk can approximate the best theoretical result for a real-world industrial mobile application. In addition, we provide some practical guidelines of test report prioritization for crowdsourced testing based on the empirical study and our experiences.